My lovely exhibition Waiting for You is still on display at the Box Factory in Adelaide until May 19. (details here) As I can’t attend every day, I’ve been working on setting up materials that will be helpful to those who couldn’t attend the opening night. 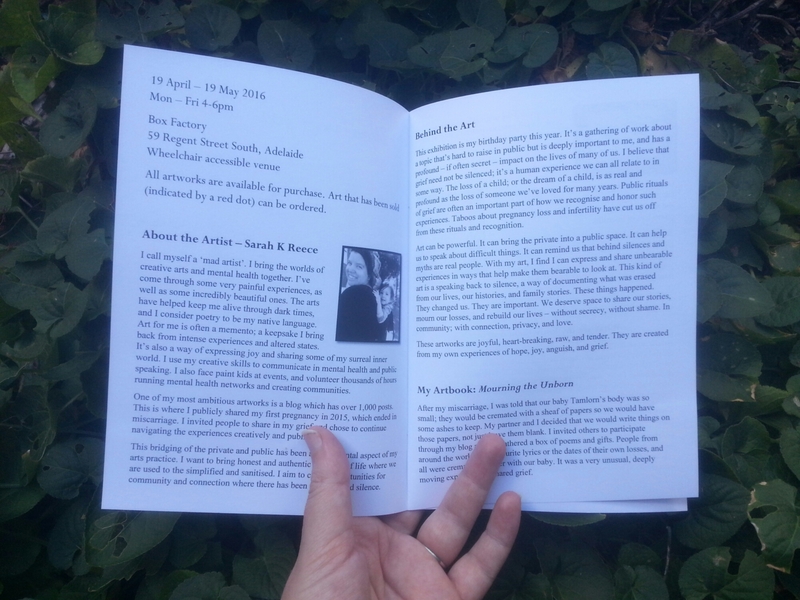 Today I finished the final draft of my brochure about the exhibition and had a collection printed, it contains information about me, how the exhibition came about, the artbook Mourning the Unborn, and prices. 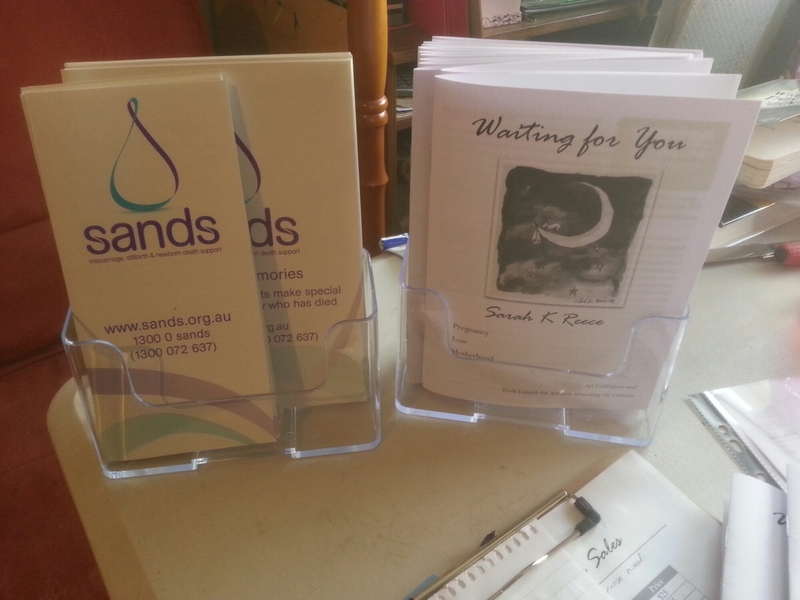 I bought these stands today, and they are now on display alongside brochures from Sands, all free for anyone. There’s also a display copy of the artbook for people to have a look at. I’ve also been to the printer this week and placed the opening night orders for art and frames, and the printer there loves my work and has offered to display some framed on his wall, for sale to his customers. How wonderful! Tomorrow I will be working on a guest post for the Sands blog for Mother’s Day, which I’m very pleased to have been invited to write. It’s wonderful to see this exhibition/community event continue to grow in various ways beyond the opening night. Tonight I attended the Healing Voices film and was once again struck by how tremendously important artists of all kinds can be in creating community and bringing issues to light. While many other people did the hard work of organising the screening, artsy people wrote and directed and edited and created the beautiful content that spoke to people. I still lament that there has been no real home for me in mental health locally, but I am feeling great hope and strength in standing on the platform of arts to be part of change in the world. 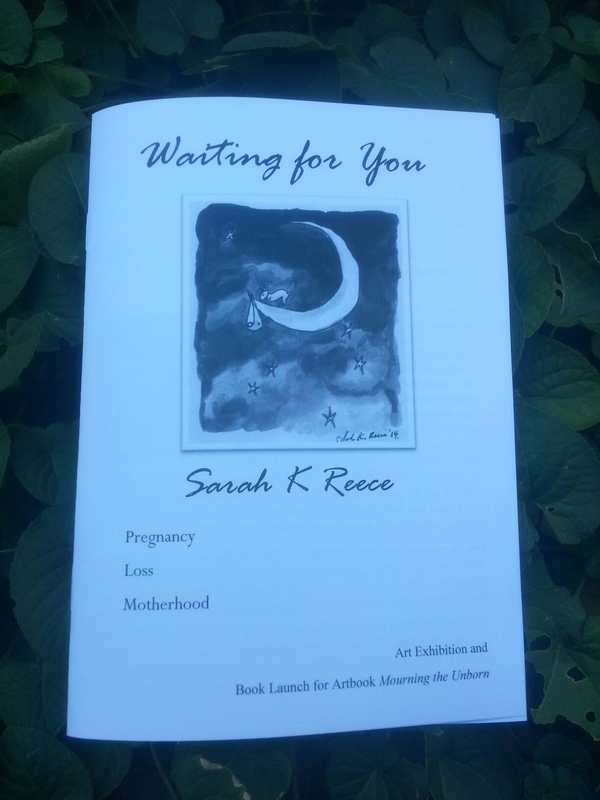 A friend from down south was lamenting the difficult hours that Waiting for You is being exhibited currently, and asked me if I might be interested in finding a hanging space for it in her area sometime. I think that would be a fantastic idea and I am keen to explore other opportunities for the exhibition beyond May. I’m also quietly giving some thought to World Hearing Voices day coming up later this year and what I might be able to do as an artist to raise awareness and be part of that. There’s a place for me somewhere.